The author has sought to make the contents ecumenically relevant. The book assumes a level of proficiency in English suitable for tertiary-level study. The contents focus especially on developing reading skills. The eleven units in Section 1 provide instruction and practice in the skills of reading comprehension in English, using authentic theological texts. The way in which meaning is conveyed through mode of discourse, genre, organization of ideas, paragraph and sentence structure, and the skills of scanning, skimming and interpreting cohesive devices are included. The thirteen units in Section 2 offer practice in applying reading, listening, writing and speaking skills. English for Theology is and has been tested by a variety of students and their teachers in the region, including lecturers and selected students at the Auckland Consortium for Theological Education within the University of Auckland, New Zealand, teachers and students in West Papua (Uniting Church), and individual students from Vietnam and China studying in the Philippines. Copies have also been made available for individual use and/or in selected student libraries in the Philippines, Indonesia, Iraq and East Timor. The common theme in feedback to date is that the book is 'very helpful' to students and teachers alike. 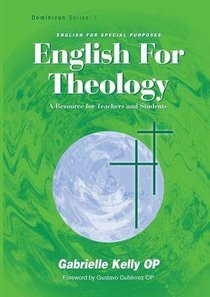 - Publisher English for theology is a practical language development resource written in response to the needs of tertiary theological students from non-Englsih speaking backgrounds. The book can be used as a text book in a class setting or as a book on a one one with a student by themselves. The book includes a Foreword by Gustavo Guierrez OP and is written by a qualified English as a second langauge - ESL - teacher. English for theology is a practical language development resource written in response to the needs of tertiary theological students from non-Englsih speaking backgrounds. The book can be used as a text book in a class setting or as a book on a one one with a student by themselves. The book includes a Foreword by Gustavo Guierrez OP and is written by a qualified English as a second langauge - ESL - teacher.